ca. 550 - 540 B.C. 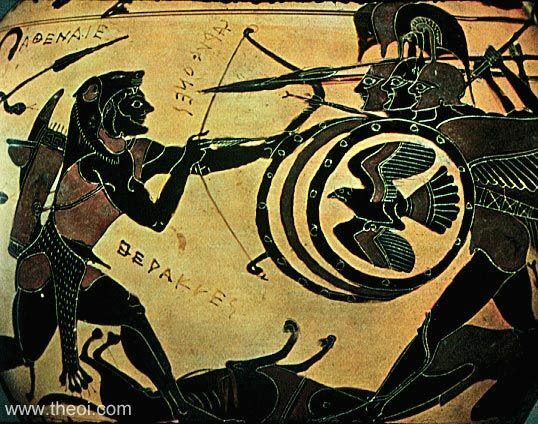 Heracles battles the three-bodied giant Geryon. The hero wears a lion-skin cape and quiver, and fires arrows from a bow. Geryon has three heads, upper torsos and pairs of arms set atop the lower torso and legs of a single man. His triple form is flanked by (two pair of) wings and each body is equipped with a spear, shield and helm. The slain herdsman Eurytion and two-headed dog Orthrus lie at his feet. The hero is supported by Athena, his patron-goddess, whose aegis-cloak is adorned with six large, writhing serpents. Behind her stand the giant's cattle.